Alex Marwood’s The Wicked Girls tells the story of two 11-year old girls, convicted of the murder of a four-year old child in the eighties and the resulting public outrage. After 25 years, Kirsty and Amber meet by accident during the investigation of a series of murders at second-rate seaside town Whitmouth. This was one of those books which made me wish my journey to work was longer – Marwood demonstrates genius at capturing the grubby glamour of the British seaside town and the plot never ceases to draw the reader in. The characters are painfully real; the downtrodden fairground cleaner Amber gives the reader a crushing sense of being trapped in a situation she can’t get out of while at the same time being only too aware of others’ low expectations of her, and hers of herself. The controlling and bullying Vic will remind the reader of that feeling of being in a relationship where you are always on the back foot while Kirsty hides a multitude of insecurities and secrets behind a confident exterior. The supporting characters are no less finely-drawn; fellow cleaners Blessed and Jackie and frustrated house-husband Jim don’t lack for detail and imagination. The exploitation of the public by the media is explored in such a way that you find yourself subsequently examining your reaction to every story in the newspaper – in the hysteria around both the Whitmouth killings and the reporting of the 1986 murder there are echoes of >Chris Jefferies (the wrongly-accused landlord of murder victim Joanna Yeates who was subjected to trial-by-media) and the prurient glee which surfaces every time the Jamie Bulger case pops up in the news. Marwood’s depiction of press intrusion, fact-free journalism being outrageously misleading in its use of innuendo and the baying mob mentality from the public is perfectly executed. Anyone following the Leveson inquiry will also recognise the pressure that journalists are put under to get a story, pressure which Kirsty suffers both as a journalist and a working mother expected by her employer to put her job above her family. Without wishing to spoil the book for anyone who hasn’t read it, the final sequence is simultaneously mesmerising and terrifying, while the preceding chapters contain some brilliant twists and turns. 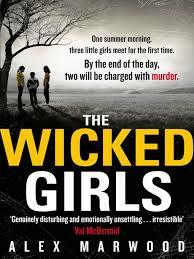 The Wicked Girls is unsettling, unputdownable and a must-read. As Alex Marwood’s debut novel, I really hope there will be many more like it. I loved it! This book had me angry, nervous, sympathetic, and sad. My emotions ran the gamut and that is absolute aces in my book 🙂 I felt for each girl willing everything to be perfect for them somehow. Great characters. Some that you just wanted to smash. When a book gets your dander up you're going to enjoy the ride. Highly recommend The Wicked Girls, you will NOT be disappointed!